It's not the most popular Google service, but Google Realtime is useful as an alternative to Twitter's search engine. The service is no longer available at the moment, the "Realtime" option disappeared from Google's sidebar and google.com/realtime returns a 404 error. Google says that this is just temporary. "We've temporarily disabled google.com/realtime. We're exploring how to incorporate our recently launched Google+ project into this functionality going forward, so stay tuned." Google+ doesn't offer a search feature for messages yet, but it should be available soon. It's strange to see that Google had to disable a service to add support for a new site. Search Engine Land also reports that Google's Wonder Wheel feature is no longer available. "[Google's] spokesperson said that the search tool was removed due to the 'initial stage' of the Google site redesign announced [last] week." It's likely that both Google Realtime and Wonder Wheel had to be redesigned, but Google didn't want to delay the launch of the new interface until they're ready. When Google Instant was launched, many of the advanced features were not available, but some of them were added after a few weeks. Update: The real explanation for shutting down Realtime Search is that Google's agreement with Twitter has expired, so Google no longer has access to the Firehose. "While we will not have access to this special feed from Twitter, information on Twitter that's publicly available to our crawlers will still be searchable and discoverable on Google," informed Google. That means Twitter will no longer have a privileged status and Realtime Search will become less useful. Microsoft and Yahoo still have access to Twitter's private APIs. This is the best one and Google Realtime Search, Temporarily Unavailable but it is useful application..
That's good that it's unavailable. I always got confused of it. It is huge information in the site.Every time any information updated. I hope they integrate it properly into Google+. Realtime is incomparably better than Twitter's own search engine. Twitter won't let you search more than 20 posts, there are no automatic updates, posts are usually delayed several minutes on Twitter (well down on "instant updates" there, Twitter) and there's no way to see changes in a certain trend either. Google really pwned realtime updates. I followed all the buzz on Google realtime instead of twitter. Please remember: most of us could NOT access Google+. And this kind of service-down only make us feel MUCH WORSE because it look like you even care more about those CHOSEN ONEs. Realtime was probably in the top 3 'refinements' I would regularly select from the left sidebar. Perhaps it could be better named; I have shown it to several friends and they really liked it once they realized what it was. Perhaps a name like "Just Posted" or "Happening Now" would make it more apparent? Google did 99 % right with Google +. One mistake is only be able as a user to toggle the profile completely secure and wide open. I would like people to find me on G+ but not on the web. They also would need to open up the network right now and quickly add finesse/services as games, polls, questions, lifestyle tools like a online group book club, plan trips tool, local deals, news and apps. They should also partner with Rdio and Spotify to let users create their own top charts. Together with Google Music it would be fantastic. It could even have star pages for news about Madonna, Beatles, James Blunt for example. Second thing they need is to build together huddle/mobile chat with web/Gtalk chat. But the most important thing is events!! Open it up Google! Right now the service is dying for every day.. Get it while it hot and new! 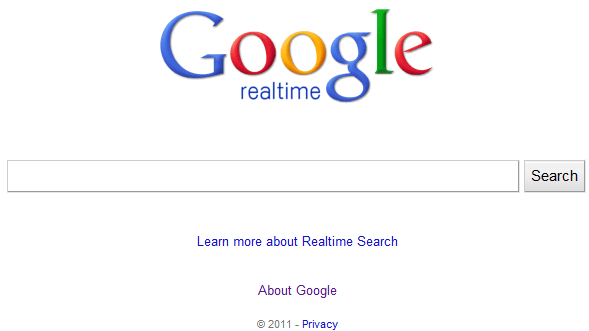 Hope this "realtime popular search" service will be back again. Topsy is a great alternative to Google Realtime Search. This is quite a meaningful way to search for up todate information. We need it back please. You make us addicted to such technology then you remove it. - Another Tunisia...Egypt.